This article explains how to check which Ground Units are paired with a specific Air Unit. Make sure that the computer on which the CONNEX Management application is installed is connected to the Air Unit via a Micro USB cable. Launch the CONNEX Management application by double-clicking its desktop icon. Click the Link Configuration tab. 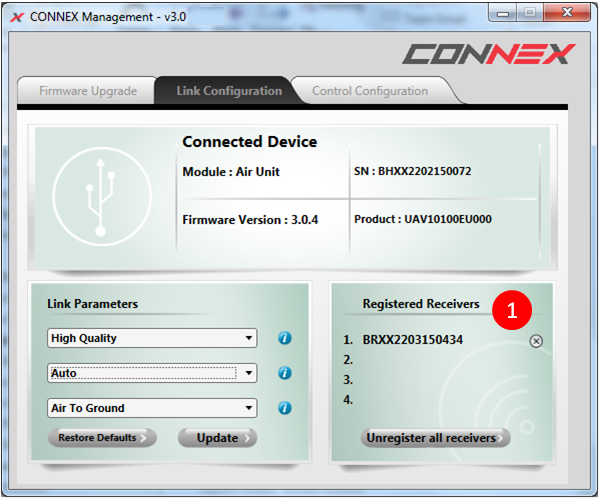 The MAC ID of a specific Ground Unit can be seen using the CONNEX Management application.